creative savv: Remember those spring-flowering bulbs I potted? Remember those spring-flowering bulbs I potted? I'm almost done planting them all out. 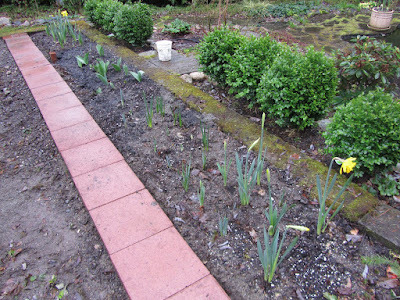 Here are most of the daffodils and tulips. It's a section under the cherry tree, where we had strawberry plants that never did very well. I think it was too shady for them. So I've pulled out the strawberry plants, and put an assortment of yellow and white daffodils, and the mixed Darwin hybrid tulips (Darwin hybrids naturalize in our area). This area of the garden is in view from the kitchen and family room windows. I've also been working in an area in view of the driveway, breakfast room/nook, and walkway up to the house, planting yellow daffodils and grape hyacinth. 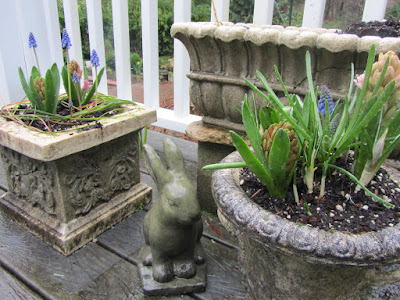 Those pesky squirrels have been digging up the grape hyacinth, chewing on them a bit then moving on to the next. 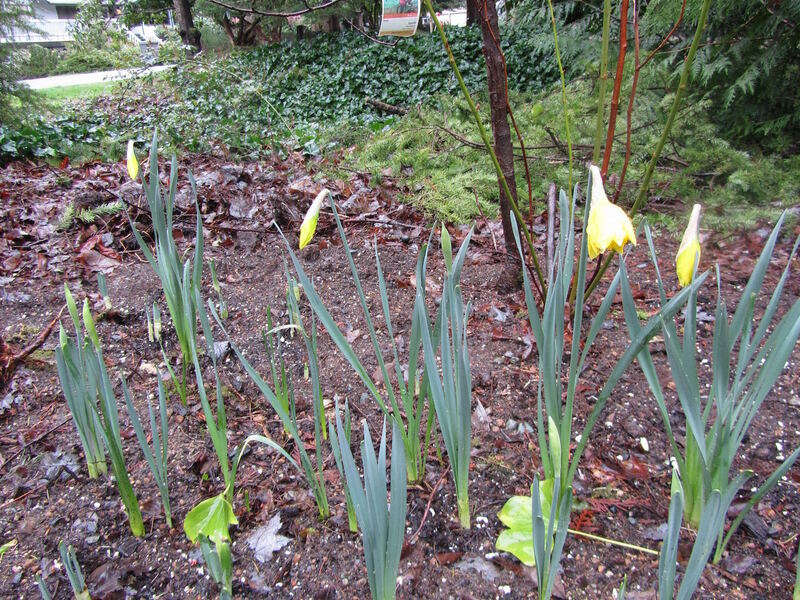 Fortunately, they leave the daffodils alone. I'm going to make up some red pepper spray to spray over the grape hyacinth. I'll need to spray near-daily, as it's very, very wet here this March. 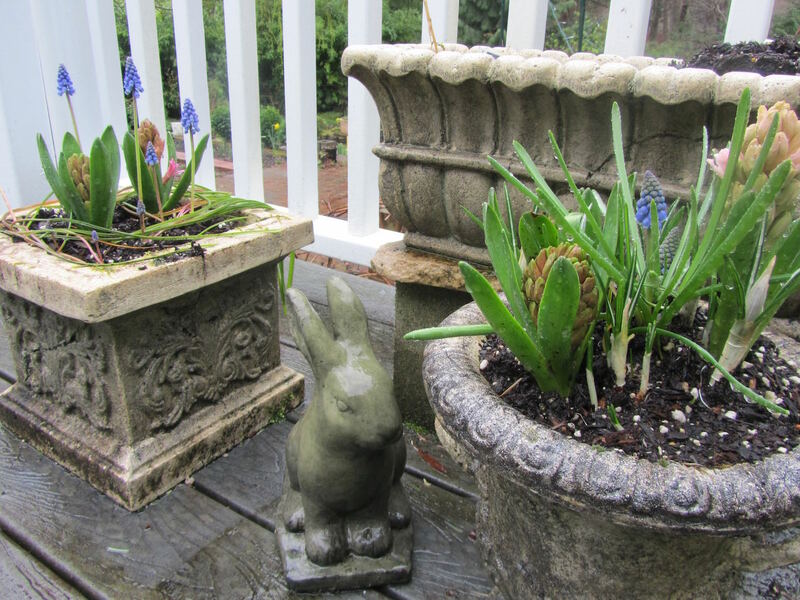 About half of the pink, large Dutch hyacinth are in an area along the walk to the pond (where I had a few other pink hyacinth), and the other half I used in pots, (such as these in the photo below), on the deck. Most of what I planted, I put in view of the house. Some springs, it is so rainy (like this year) that I have very little opportunity to get outside to see the flowers. So having the flowers in view of the house allows us to enjoy the blooms even when we can't be outdoors. Buying all of these bulbs on clearance worked out very well for me. I was able to save 75% on all of the bulbs, pot them in early winter after Christmas when I had time, then move them outdoors as the weather became manageable for outdoor gardening. I will definitely be doing this again next year! You know, I often just try something out, even when I don't know if it will work. Some times these experiments work out, and sometimes they don't. But I figure that I'll never know if something will work if I don't try. And now, for the future, I know that I can buy bulbs in late fall, plant in pots in the garage, then move them outside when the temps are not so freezing, to be planted in the ground without a huge rush. In all of my replanting, I only came across about 3 bulbs which rotted in the pots, out of 155 bulbs. That's pretty good, I think. I could have just as easily lost a few bulbs over winter, if directly planted in the ground in fall. To give cover to the ground after the spring bulbs are done for the season, I've started some annuals from seeds, under grow lights, to take their place later in spring. 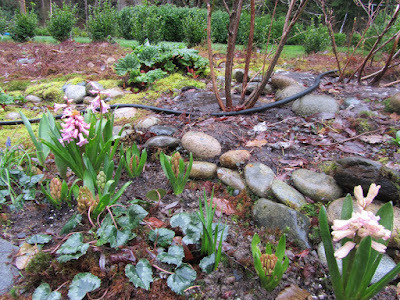 That was such a good idea, Lili, to plant those bulbs in the winter like you did. It's so enjoyable to see flowers blooming when it's still officially winter. I am planning to try doing this in the future. It's been wonderful for all of the early flowers in the NW. Hard to believe that it is still winter! Enjoy all of the flowers in your area! Yes, such a good idea to plant in pots! 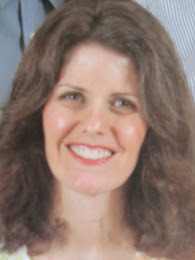 I really would never have thought to do it, but you've given me something to consider for this next year. And putting them where you can see them most sounds like a great idea! We have an area that is both outside our back door (which is from our garage) and the kitchen window. It was an eyesore the first few years due to constantly being soaked from the neighbor's water leak. They finally fixed that and I dug it up, installed a concrete block edging and added lots of amendments. But nothing seemed to grow well there. I've continued working on that soil the past few years, and two (or maybe three?) falls ago planted some tulips out there. Those grew, so last fall I added more tulips and some daffodils, and some other bulb that came in with them that I can't remember. Things are growing like crazy out there this year, and will give me a nice view as well. It is really cheery to look out a window and see the flowers, isn't it? I'm glad your tulips and daffodils have done so well in that troublesome spot. It sounds just lovely! That's something I'm concerned about, too, that our fruiting trees will bloom before we have a lot of bees around, or before a really cold spell. Last year, most of our apples got caught by an early-spring cold spell. Hoping for apples this year. So glad to hear your crocuses are just going crazy in your yard! So cheering, isn't it?! Enjoy them! It sounds like more work than it really was. My two daughters helped me. 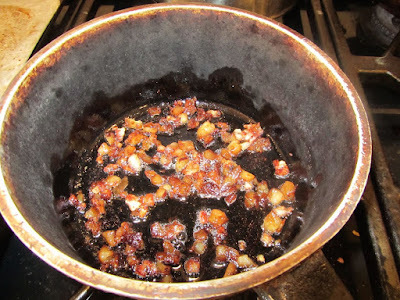 I would pour soil into a bunch of 1-gallon pots, then they'd drop 3 or 4 bulbs into each pot. 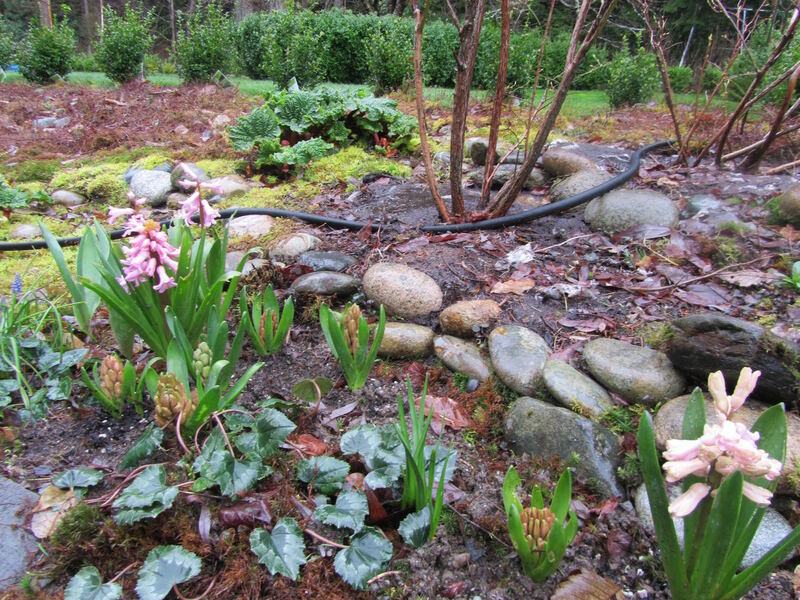 After, I'd come around with the bag of soil again, and top off the bulbs with soil. The transplanting part is what I really enjoy. 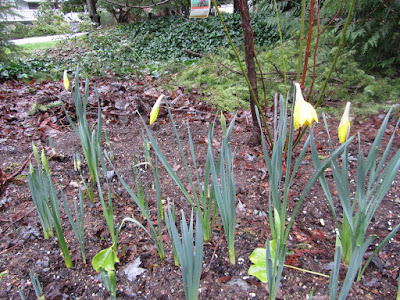 You get that feeling of immediate gratification, by seeing the bulbs are already up and near bloom time. I have a hard time in spring and summer resisting all of the flats of annuals at the garden center. I just want to buy and buy and buy! the beauty one person can bring into the world. I am glad you are seeing so many bits of spring. Before it has officially arrived. I'll check out that story. thanks! Lili, your yard look beautiful. It must be very enjoyable to see all the flowers when you look out the windows.